Protecting six prehistoric pueblo villages in a twenty-mile expanse of mesa tops along the Colorado–Utah border, Hovenweep National Monument is noted for its solitude and undeveloped, natural character. The name Hovenweep was bestowed on the region by explorer and photographer William Jackson in 1874. It is a Ute Indian word meaning “deserted valley,” referring numerous small river valleys that feed into lower McElmo Creek and the San Juan River. Proclaimed as a National Monument on March 2, 1923, by President Warren G. Harding, four of the pueblo villages are located in Colorado, including Holly Canyon, Hackberry Canyon, Cutthroat Castle, and Goodman Point. Two more sets of ruins are located in Utah include Cajon and Square Tower, where the monument headquarters are located. At the headquarters is a visitor’s center, which provides interpretive programs, maps, and guides, as well as a campground. 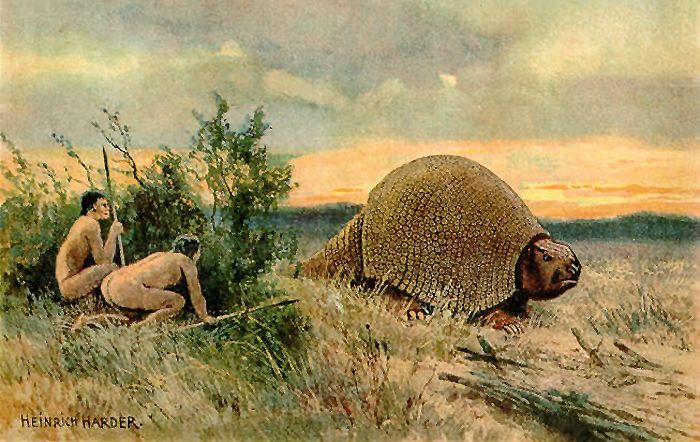 The area surrounding ancient ruins was first called home to nomadic Paleo Indians as far back as 14,000 years ago. Gathering food and hunting game, they roamed the area for centuries. Around 900 A.D. these early peoples began to settle more permanently, adopting an agricultural existence. At that time, archeologists believe the soil was rich on the mesa tops due to more moderate temperatures and higher amounts of rainfall than is seen today. 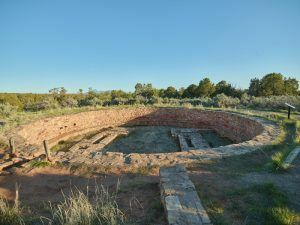 At about the same time, the ancestral Ancient Puebloans (Anasazi) began to migrate from the Four Corners area to the Hovenweep region, bringing with them their advanced building skills. 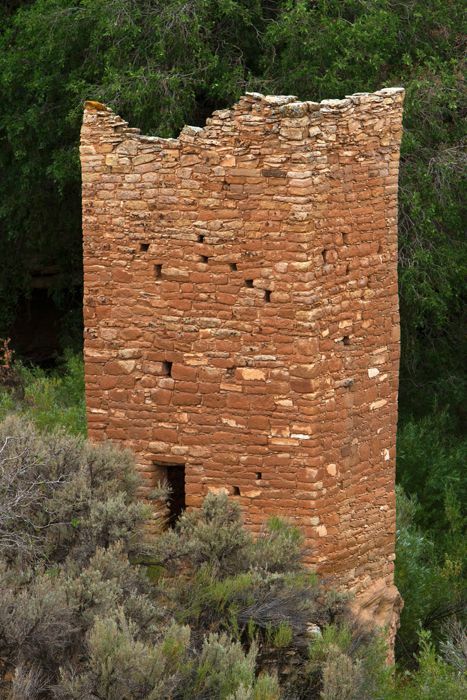 It was these Ancient Puebloans who built the first pueblos and masonry towers at Hovenweep between the years 1200 and 1300 A.D. With the increasing population, the Paleo Indians soon began building larger around fortress-like towers at the heads of box canyons. Successful at dry farming, the ancient peoples grew domesticated crops such as maize, beans and squash were grown in terraced fields. They also formed catch basins to hold water, built check dams to retain soil that would otherwise wash away, and diverted water to edible wild plants such as beeweed, ground cherry, sedges, milkweed, cattail and wolfberry. The population grew steadily and by the 1200s, the Hovenweep area was home to over 2,500 people. 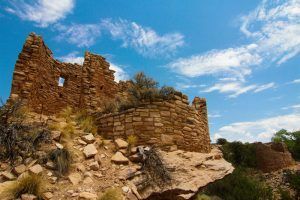 However, by the end of the thirteenth century, the people of Hovenweep, as well as other nearby ancient cities, such as Mesa Verde and Kayenta, were completely abandoned. 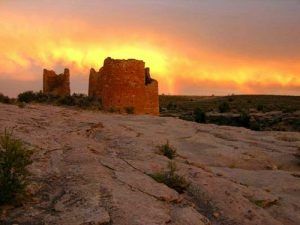 Several theories have been proposed as reasons for the Ancient Puebloans’ departure, including drought, overpopulation, disease, and warfare. Though the reason is unclear, ancestral Puebloans throughout the area migrated south to the Rio Grande Valley in New Mexico and the Little Colorado River Basin in Arizona. Today’s Pueblo, Zuni and Hopi people are descendants of this culture. The Hovenweep National Monument, encompassing some 785 acres, provides a historic view of dozens of ancient ruins, including square and circular towers, cliff dwellings, kivas, and pueblos. The masonry style and architecture at Hovenweep is skillful, with careful attention given to detail, indicating that the inhabitants of Hovenweep were closely associated with groups living at Mesa Verde and other nearby sites. 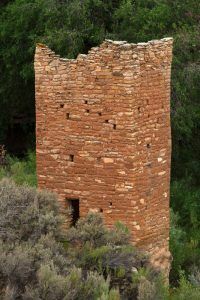 Many theories have attempted to explain the use of the various structures at Hovenweep, most often the use of the numerous towers. Though there exact purpose is uncertain, archeologist theorize they could have been celestial observatories, defensive structures, storage facilities, civil buildings, homes or any combination of the above. While most of the towers are seemingly associated with kivas, their actual function remains a mystery. The Hovenweep structures were first discovered by white settlers in 1854, more than 30 years before the more famous cliff dwellings at nearby Mesa Verde. It was on an expedition of Mormon colonists, led by W.D. Huntington, that the first sighting was recorded. During the years of 1917-18, J. Walter Fewkes of the Smithsonian Institute included descriptions of the ruins in published archaeological survey reports, and recommended the structures be protected. The six major Hovenweep site groups are located within a 20-mile drive of each other along the Utah – Colorado border. These units vary greatly in size, the largest of which is the 400-acre Square Tower Group. Both this group, where the Ranger Station is located, and Cajon Ruins are located in Utah. The Colorado sites are Holly Ruins, Hackberry Canyon, Cutthroat Castle and Goodman Point. Today, visitors to Hovenweep enjoy short hikes, natural quiet and some of the finest examples of ancestral Puebloan architecture in the southwest. The trail system provides access to each of the cultural site units. All units are open to the public but most are in remote locations and can be difficult to reach. The Square Tower Group is the primary contact facility with a visitor center, campground and interpretive trail.